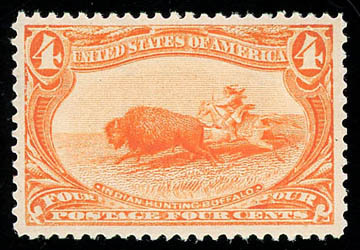 1898, Trans-Miss., 4¢ orange, o.g., never hinged, bright and fresh with rich radiant color, well centered with nicely balanced margins, Very Fine and choice, a stunning mint stamp. 1898, Trans-Miss., 4¢ orange, o.g., never hinged, huge margins, reperfed at right, Extremely Fine appearance; with 2015 P.S.E. certificate. 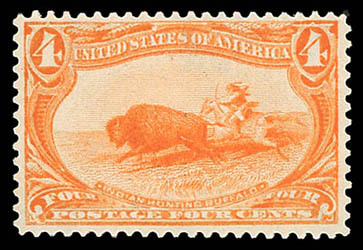 1898, Trans-Miss., 4¢ orange, top margin plate block of 6 with plate number and imprint, o.g., barest trace of hinge (if at all) at top center stamp, others never hinged, remarkably well centered throughout, brilliant color, top left stamp with slight natural gum crease, otherwise Extremely Fine, still one of the finest centered examples of the 4¢ Trans-Miss issue; with 1986 P.F. certificate. 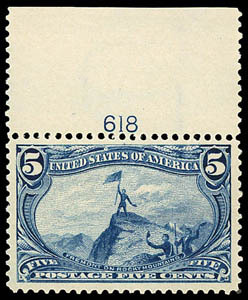 1898, Trans-Miss., 5¢ dull blue, top margin plate "618" number single, o.g., never hinged, well centered amid large oversized margins, rich color on bright paper, Very Fine to Extremely Fine; with 1989 and 2003 P.F. & 2016 P.S.E. 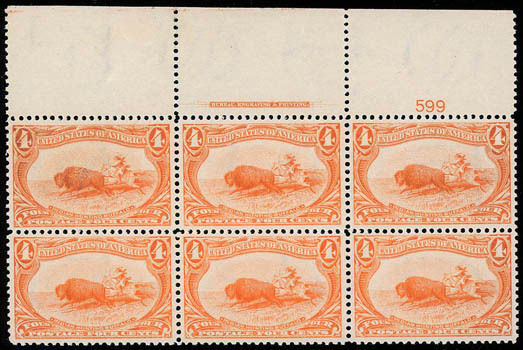 certificates, the latter Graded (VF-XF 85J, SMQ $525). 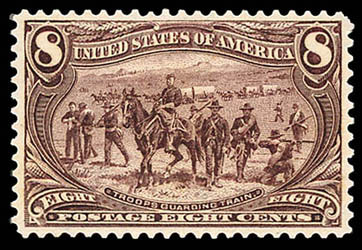 1898, Trans-Miss., 8¢ violet brown, o.g., never hinged, rich vivid color, choice centering, fresh and Extremely Fine; with 2001 P.F. certificate for pair. 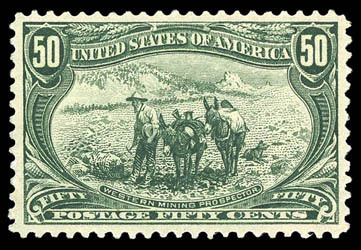 1898, Trans-Miss., 50¢ sage green, o.g., lightly hinged, precision centering, rich bold color and Post Office fresh, Extremely Fine and choice, an exceptional mint stamp; with 1978 and 2016 P.F. 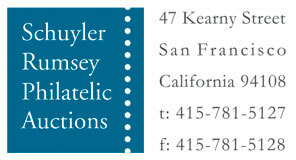 certificates. 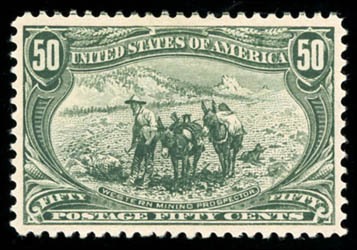 1898, Trans-Miss., 50¢ sage green, o.g., lightly hinged, choice centering amid well balanced margins, rich intense color, Extremely Fine and choice; with 2002 P.F. and 2016 P.S.A.G. certificates, the latter Graded (90, SSV $1,000). 1898, Trans-Miss., $1 black, o.g., barest trace of hinge, choice centered, deep color and quite fresh, Extremely Fine, in our opinion - a bit undergraded; with 2016 P.F. 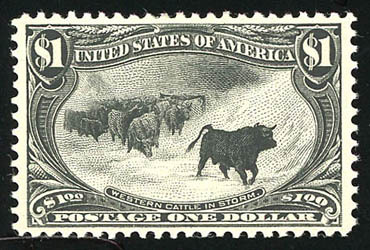 Graded certificate (VF 80). 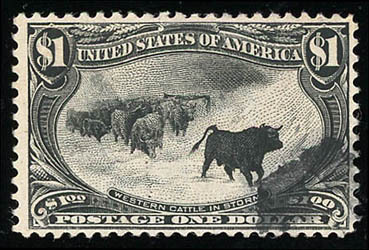 1898, Trans-Miss., $1 black, o.g. (slightly disturbed), fresh & Fine. 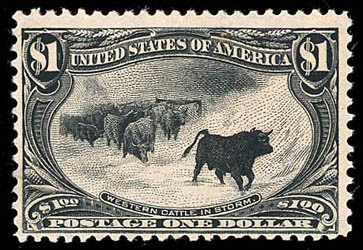 1898, Trans-Miss., $1 black, cork corner cancel, strong bold color, F.-V.F.